When it comes to solving word problems in the math classroom, children should be able to explain their thinking. This includes identifying the strategies they used and the thought process behind their decisions. Students should use grade-appropriate math vocabulary and models that demonstrate the steps they took to solve a problem. In this post, we're going to take a look at how screencasting can be used in a fourth grade classroom to meet a Common Core State Standard while addressing a 21st century skill: communicate clearly. In the fourth grade, students are expected to "Use the four operations with whole numbers to solve problems." (4.OA.A) In order to demonstrate their understanding of this skill, children should be able to clearly communicate the steps they took to solve a problem by identifying which strategies they used to find their answer and include math vocabulary in their explanation. 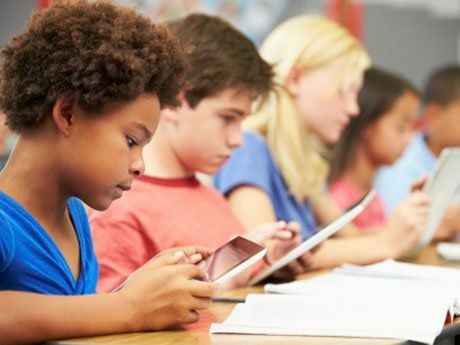 For the 21st century skill of communicating clearly, we ask children to speak for a variety of purposes (for example, to inform), to articulate thoughts clearly and to make use of technology. Fourth graders can meet the Common Core Standards and demonstrate their mastery of this 21st century skill by using iPad screencasting apps to explain their thinking. A screencasting app gives children the ability to create a video that shows them writing on their iPad screen and captures their voice as they solve a word problem. This type of technology gives children a space to draw pictures, annotate an image and narrate a multi-step procedure. Screencasting is a straightforward task that requires students to think through problem-solving steps and the best way to explain their thought process. 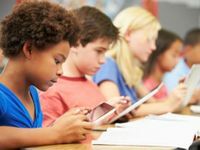 Most screencasting apps follow the same format of giving children a virtual white board to write on, the ability to add images to the screen, and a record button that captures their voice using the iPad microphone. Here are three of my favorite (absolutely free!) iPad apps that can be used to capture student thinking as they complete a word problem. The Screenchomp app is the perfect choice for trying out screencasting. The simple-to-navigate user interface and kid-friendly features make it great for a fourth grade classroom. Early elementary school students will also find that this app is easy to use. Children can record their voices as they write on the screen. Then they can play back their finished video from the device, or email a link to the clip. Educreations is my go-to app as an instructor, but it's definitely straightforward enough for fourth grade students to use. Kids can record as they draw on the screen and add images. They can include pictures saved in the iPad's Photos section or snapshots directly from their iPad camera. Doceri is an app with tons of fantastic features, but it might all be a little overwhelming for elementary school students. I would recommend introducing the concept of screencasting to younger children with Screenchomp or Educreations, and then trying out Doceri. This app makes it easy to draw lines and shapes, so it's a great fit for the math classroom. Doceri also lets you save your final video to the Photos section of the iPad. The PARCC Assessment's website offers examples for teachers looking to prepare their students for Common Core-aligned exams. Try posing those sample questions to your students and have them record their explanation using a screencasting app. How do students in your classroom communicate their thought process? Have you tried any of these screencasting apps?